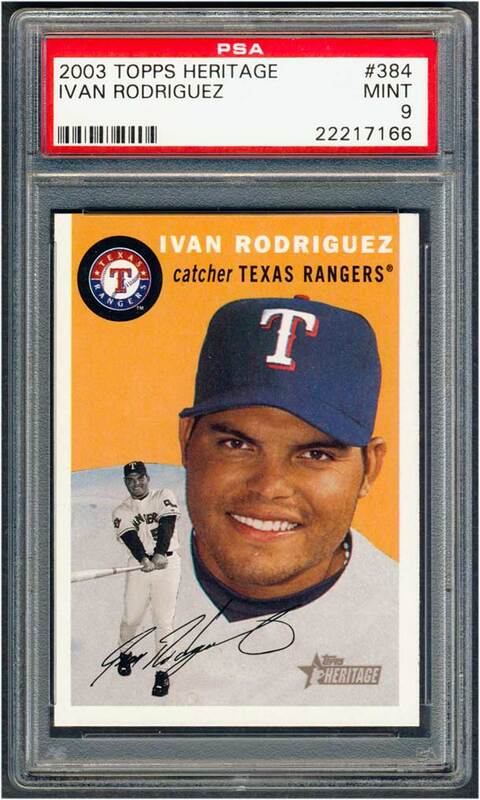 Comments: In May, 2007 I submitted a 2003 Topps Heritage Ivan Rodriguez card that I had purchased at one of the Nationals and it received a NM-MT rating. I've been looking for a nicer copy ever since. I purchased a few here on the internet but they were NM at best. My eBay searches for a graded card have come up blank. Many of the singles listed on eBay in that time frame looked NM+, not good enough to bump my copy. They don't come up too often and I also had no luck finding nice examples at shows. I've also reached out to some Heritage collectors and have come up empty. 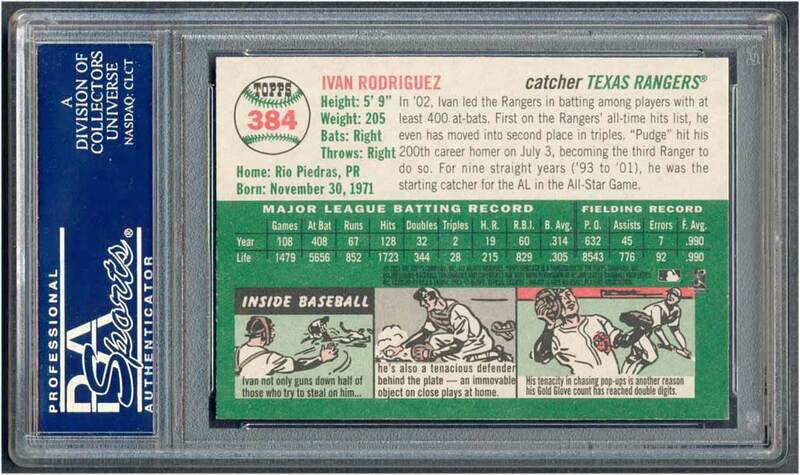 Finally, I found an auction in October of 2013 for a "Pick 4 Short Prints - BIN $10" and the seller had four copies of the Pudge card. I picked up all four and upon receipt - only one was worthy of submission. These cards are surprisingly tough IMO. So many of them have slightly dinged corners, or rough cuts. I included the card in a submission using a 15-free gradings voucher I received from PSA for joining their Collectors Club. UPDATE: In late May, 2013 I sent PSA a group of 175 raw cards that I had purchased at shows and on eBay over the course of several years for grading/authentication. I waited two plus months for the submission and during that time decided to have a little fun. Normally, I get the email from PSA indicating grades are available and I go online to review the results. When I receive the package I open it up look through the cards and start the scanning process. The entertainment ends there. This time I decided to do things a little differently but it would take extreme discipline. I didn't go online to look at the grades and the package arrived for pickup on August 23, 2013. I asked my wife to open the box and randomly distribute the contents into a large storage bin. The bin went into the closet and each day for the next 6 months my kids would take turns pulling out a card for me. One card at a time, it was like Christmas every day. I'm involved in a private chatroom of sportscard collectors where I would post a picture of "The Card of the Day" for the guys to follow along. The kids loved it too! It was so fun I tagged on two more submissions (one for 15 cards received back in early Dec, 2013 and another 53 card submission returned in Feb, 2014) and lumped them in with the other cards as they came back from PSA. The original 175-day quest has now turned into almost a year-long adventure. This Pudge card was Day #123. 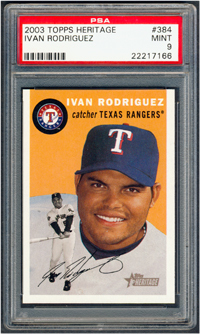 I didn't think a GEM MT rating was possible but I'm extremely happy with this MINT copy - received back from PSA on 12/11/2013! Now, I'll have to keep my eyes peeled for a GEM example. 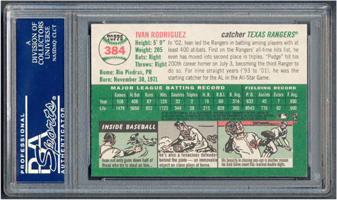 UPDATE: On January 29th, 2014 I receive another submission back from PSA with another PSA 9 - still no 10. It's slightly better centered so I swapped it out with the other nine. UPDATE: In late February, 2015 I found an eBay auction for a “You Pick” from a new lot of 2003 Heritage SPs for $3 + S&H. The seller looked reputable and the cards looked pack fresh. 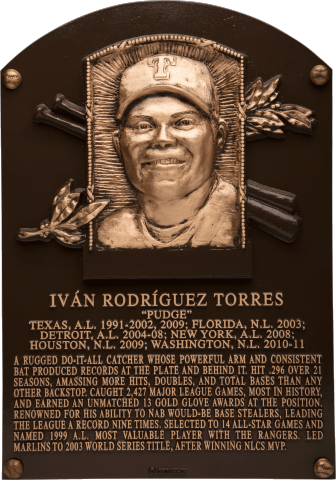 I decided to pick up a single of Pudge with the hopes of scoring a gem. It arrived a few days later and I opened the envelope like it was a new pack. Sharp corners – centering off left to right. No luck.